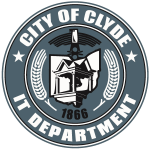 The City of Clyde, Ohio offers publicly available data in machine readable format via an Application Programming Interface (API) service: API.Clydeohio.org. This service is offered subject to your acceptance of the terms and conditions contained herein. All of the content, documentation, code, and related materials made available to you through the API.Clydeohio.org site are subject to these terms. Access to or use of API.Clydeohio.org services or its content constitutes acceptance to this Agreement. "This product uses The City of Clyde, Ohio Data API but is neither endorsed nor certified by The City of Clyde, Ohio." You may use City of Clyde, Ohio names and logos to identify the source of data/content; you may not, however, use City of Clyde, Ohio names and logos in any other way, including in a manner that conveys the false impression that The City of Clyde, Ohio has endorsed any message, product, service, or entity (not-for-profit, commercial or otherwise). You may use any API.Clydeohio.org API to develop a service to search, display, analyze, retrieve, view, and otherwise obtain information from API.Clydeohio.org data. The API can be used on demand, or the content can be queried and pulled into a separate database managed by an organization after obtaining an account ID. To utilize the API, the organization must register and use a valid API key. The account API key must be included in each query when using the API. API.Clydeohio.org content is updated as often as is relevant to do so, and each resource includes a "last updated" field with the date and time of the last update. API users who repackage and share the data or content with the public should display the “last updated” date near the API.Clydeohio.org content. The City of Clyde, Ohio is not responsible for any collection or use of information through the application of the API key that is unauthorized, violates applicable laws, or otherwise inconsistent with the terms and conditions of this Agreement. The end use of data accessed through API.Clydeohio.org are not controlled. However, as the data owners or authoritative sources, The City of Clyde, Ohio and its respective Departments providing the data retain version control. Once the data has been downloaded from API.Clydeohio.org, The City of Clyde, Ohio cannot verify and is not responsible for the quality, accuracy, reliability, or timeliness of any analyses conducted using the downloaded data. You may not modify or falsely represent content accessed through API.Clydeohio.org and still claim the source is The City of Clyde, Ohio. Modification includes but is not limited to altering dates, data values, or document text. The City of Clyde, Ohio reserves the right to limit the volume of transactions per user in order to ensure equal access to all API.Clydeohio.org users. Use of the APIs may be subject to certain limitations on access, calls, or use as set forth within this Agreement or otherwise provided by The City of Clyde, Ohio. If The City of Clyde, Ohio reasonably believes that you have attempted to exceed or circumvent these limits, your ability to use the API may be permanently or temporarily blocked. The City of Clyde, Ohio may review your use of its services to improve the service or to insure compliance with this Agreement. If you wish to terminate this Agreement, you may do so by refraining from further use of the services. The City of Clyde, Ohio reserves the right (though not the obligation) to (1) refuse to provide the services to you, if The City of Clyde, Ohio finds that your use violates any terms listed in this agreement, or (2) terminate or deny you access to all or part of the services at any time for any other reason in its sole discretion. All provisions of this Agreement which by their nature should survive termination including, without limitation, warranty disclaimers, indemnity, and limitations of liability. The City of Clyde, Ohio reserves the right, at its sole discretion, to modify or replace this Agreement, in whole or in part. Your continued use of or access to the API.Clydeohio.org services following posting of any changes to this Agreement constitutes acceptance of those modified terms. The City of Clyde, Ohio may, in the future, offer new services and/or features. Such new features and/or services shall be subject to the terms and conditions of this Agreement. The City of Clyde, Ohio services are provided "as is" and on an "as-available" basis. The City of Clyde, Ohio hereby disclaims all warranties of any kind, express or implied, including without limitation the warranties of merchantability, fitness for a particular purpose, and non-infringement. The City of Clyde, Ohio makes no warranty that the services will be error free or that access thereto will be continuous or uninterrupted. In no event will The City of Clyde, Ohio be liable with to respect to any subject matter of this Agreement under any contract, negligence, strict liability, or other legal or equitable theory for: (1) any special, incidental, or consequential damages; (2) the cost of procurement of substitute products or services; or (3) for interruption of use or loss or corruption of data. You hereby warrant that (1) your use of the services will be in strict accordance with this Agreement, and all applicable laws and regulations, and (2) your use of the services will not infringe or misappropriate the intellectual property rights of any third party. You agree to indemnify and hold harmless The City of Clyde, Ohio, its contractors, employees, agents, and the like from and against any and all claims and expenses including attorney’s fees, arising out of your use of the APIs, including but not limited to violation of this Agreement. This Indemnification clause shall not apply to government entities. This Agreement constitutes the entire Agreement between The City of Clyde, Ohio and you concerning the subject matter hereof, and may only be modified by the posting of a revised version on this page by The City of Clyde, Ohio. Any disputes arising out of this Agreement and access to or use of the services shall be governed, interpreted, and enforced in accordance with the local, state, and federal laws of the United States of America. The City of Clyde, Ohio’s failure to exercise or enforce any right or provision of this Agreement shall not constitute waiver of such right or provision.